Everyone has been cracking up at a recent clip from BBC. 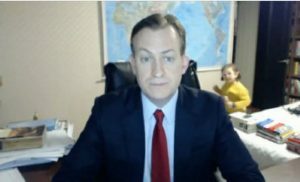 Professor Robert Kelly was being interviewed via Skype when his young children made their way into his home office for a few seconds before being accosted ninja-style by their mom. If you haven’t seen the clip, you’ve got to see it here. While most of us probably think of Skype as a fun toy for talking with family and friends, it’s also a great business tool. A few years ago, Skype became a Microsoft product, so it’s now hosted through Microsoft 365. Skype for Business allows for recording remote meetings, instant messaging and integration of Office apps like Word, PowerPoint and Excel. You can even include up to 250 people in a Skype for Business meeting, so no matter where your team is, you can connect via a personalized link, no matter what type of device you’re running. Best of all, when integrated with Microsoft Office 365, Skype for Business is fully encrypted, making it a great choice for any type of business. Your BlueCore account manager can talk with you more about the advantages of Skype for Business and how to best use it. Oh, and it shouldn’t surprise anyone that the family from the BBC interview has gone viral. Check out a recent interview with People magazine. We’re not saying using Skype for Business will cause you to produce some kind of viral content, but we guess you never know! Don’t be a victim… Happy Data Privacy Day!